A breathtaking big screen realization of the 1970 manga by George Akiyama about an abandoned feral child roaming the wastelands of feudal Japan, armed with a mouthful of fangs, big freaking axe and a superhuman will to survive. When kindness is finally shown to him, first by a stoic monk and later a tender-hearted adolescent girl, the beast within abates, but the harsh existence they face presents many antagonists to peaceful living. 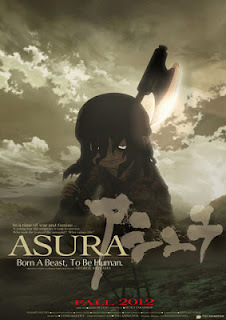 With CG characters existing within hand-illustrated environments, the film looks especially gorgeous on the big screen; ditto the sound design that gives Asura full agitated voice to his frustrations and rage. An animated film with more on its mind than simple diversion or entertainment, a worthy tribute to its once-banned source material. Winner of the Audience Award for Best Animated Feature at the 2012 Fantasia Film Festival.